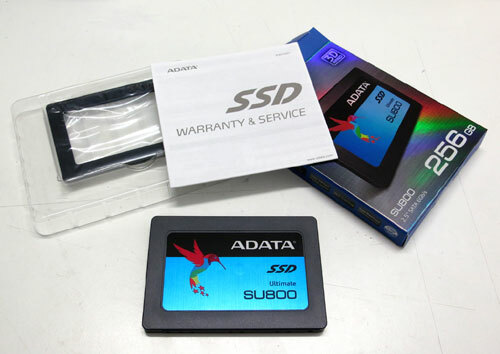 Today I'm taking a look at the Ultimate SU800 SSD from ADATA. You might remember ADATA from my previous review of their SP550 SSD. They were founded in 2001 in Taiwan, with a focus on memory and storage products. 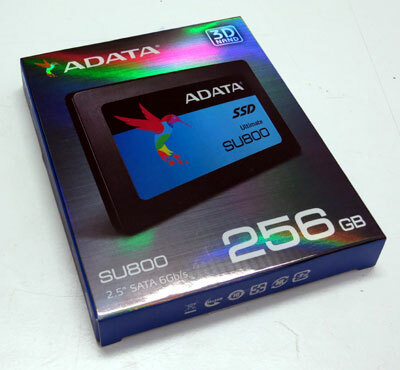 The Ultimate SU800 brings ADATA into the world of 3D NAND. This technology stacks layers of NAND cells vertically, giving greater capacity through increased density, and lowering the cost per gigabyte. We have a 256GB sample, but this model is also available in 128GB, 512GB and 1TB. There seems to be an M.2 version of it as well, but this one is in the standard 2.5" 6Gb/s SATA configuration. The package is quite minimal, as seems to be the norm for SSDs. You get the drive itself, a spacer to fit this 7mm drive into a 9.5mm bay if needed and a small warranty booklet. Speaking of which, ADATA offer a 3-year warranty on this drive, and claim a Mean Time Between Failures of 2,000,000 hours. This drive is typical of every other 2.5" SSD I've seen, in that it is featureless except for the SATA data and power connectors, mounting screw holes on the bottom and sides, and info stickers on top and bottom. Curiously the top of the case for this drive is plastic, which has changed from the earlier ADATA drive which used metal. It makes for nicer rounded corners than the older drive but still, a plastic case seems an odd update for an "Ultimate" drive. In fact, by simply pulling on one corner I could flex the plastic up and start to separate it from the metal chassis, which doesn't feel too inspiring in terms of build quality. There's no software included and the drive ships unformatted, but you can simply plug it into your PC, format it and use it with no special software required. 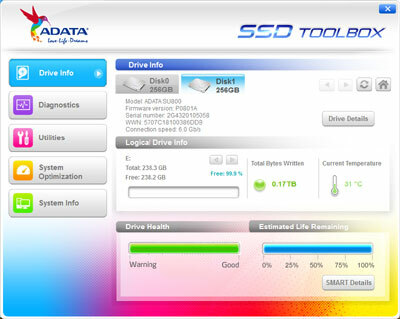 ADATA do have a handy little SSD Toolbox available, and the box includes a download link for a copy of Acronis True Image HD to help migrate your data from another drive. I already had a previous version installed on the testbed and it prompted me to update to a newer version when I ran it. Despite a small spike of network traffic, nothing seemed to happen. So I downloaded the latest version from their website - I'm still not a fan of their requirement to log in with an email etc before being able to download this software. But soon enough I had it up and running. It's handy for checking connection speed, temperature and other diagnostics, as well as updating firmware or securely erasing the drive. The drive arrived unformatted, and when formatted it gave us 238.35GB - exactly the same size as the Samsung 256GB M.2 boot drive in the testbed. 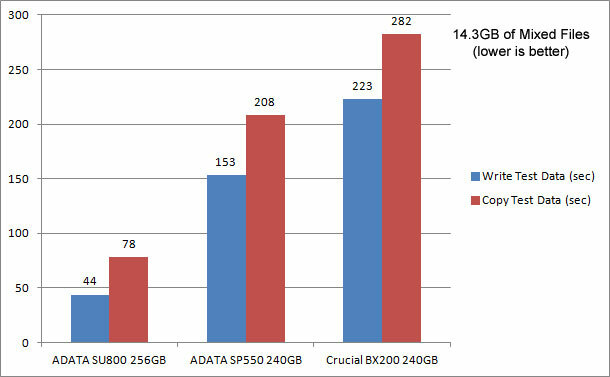 So let's run it through its paces compared to the older ADATA drive and also Crucial's budget-friendly BX200 which I also reviewed earlier. The testbed PC is based on an ASUS Z97-A, with an i5-4690S and 16GB of RAM, running Windows 10. The SU800 is priced about 20% both of the other drives at the same capacity, so we'd expect it to handily beat them. The three drives are very even here. 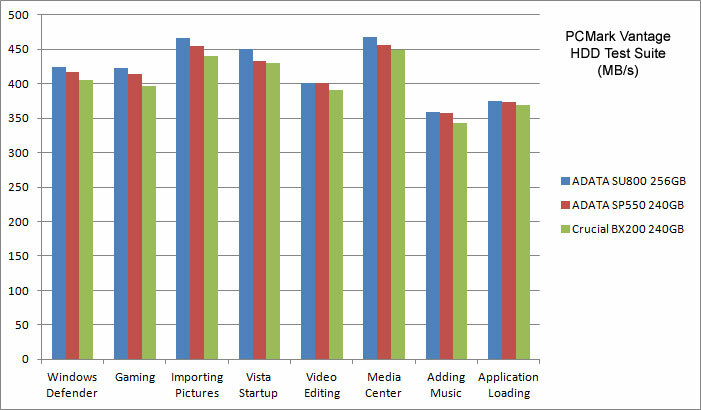 The newer ADATA scores very slightly better in write speeds and the older ADATA very slightly higher in read speeds. But there's essentially no difference between all three. Now we move on to PCMark Vantage, which is an older benchmark but still useful for storage testing. The HDD test suite plays back data traces recorded while performing common tasks such as running Windows Defender, loading applications, booting Windows etc. Here the results are close again, but a more clear trend is visible. 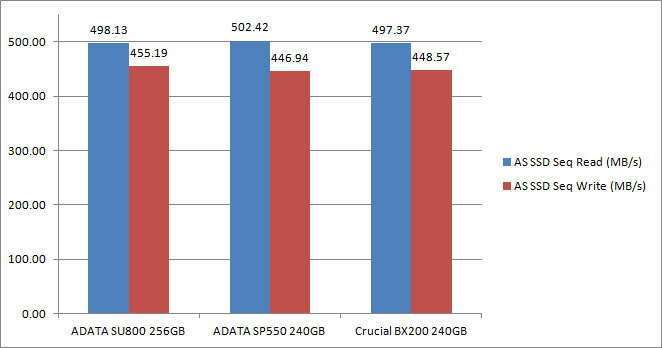 In every test, there is a slight advantage to the SU800, followed by the older ADATA drive and trailed by the BX200. Curiously the SP550 is not displaying the issue it seemed to have with the "Media Center" test when we reviewed it previously. Now for some real-world testing, with a set of real-world data. This test data set consisted of some large media files of 400MB to 1.5GB each, one 6GB .bz2 archive, nearly a thousand photos and small videos from my camera, two thousand small documents and spreadsheets and a couple of application installation directories. In total, 3,400 files adding up to 14.3GB. This data set was first copied to each drive from a much faster PCIe SSD. I then copied it from each drive onto itself again, leaving two copies on the drive being tested. In each case I simply timed the copy operations with a stopwatch. Each test was repeated twice and the times averaged. Here the results were quite surprising. I re-ran them several times, rebooting and so on to make sure they were repeatable, and they were. The SU800 simply thrashes the other drives in this test. Watching the file copy go across reveals one hint as to why - the other two drives, as expected, start fast and then slow down quite dramatically once their caches are exhausted. This seemed to happen once the copy reached the 6GB .bz2 archive. But the SU800 just didn't slow down, sitting on about 490MB/s for that whole file. So the copy-to-itself test, which took nearly 5 minutes on the BX200, took under a minute and a half on the SU800. Today we compared this "Ultimate" drive from ADATA to an earlier ADATA drive and a budget-friendly Crucial drive. It's priced above both of them, so we should expect it to beat them both - and it did. In the benchmarks there wasn't much between them, but in the real-world testing it really shone. In fact, the performance during the file-copy tests was a pleasant surprise. A quick look at pricing shows this drive to be about $120 AUD on the street, compared to about $100 for the cheaper drives. I'm hesitant to strongly recommend it without testing it directly against its price-peers, but it definitely seems to be worth the small price premium over the others we tested. The handy included software and three year warranty are the icing on the cake. Thanks to ADATA for providing the review sample. Feel free to discuss this review in this thread.